Who better to kick off our maiden voyage into galleryhood than the insanely prolific Jack Teagle. 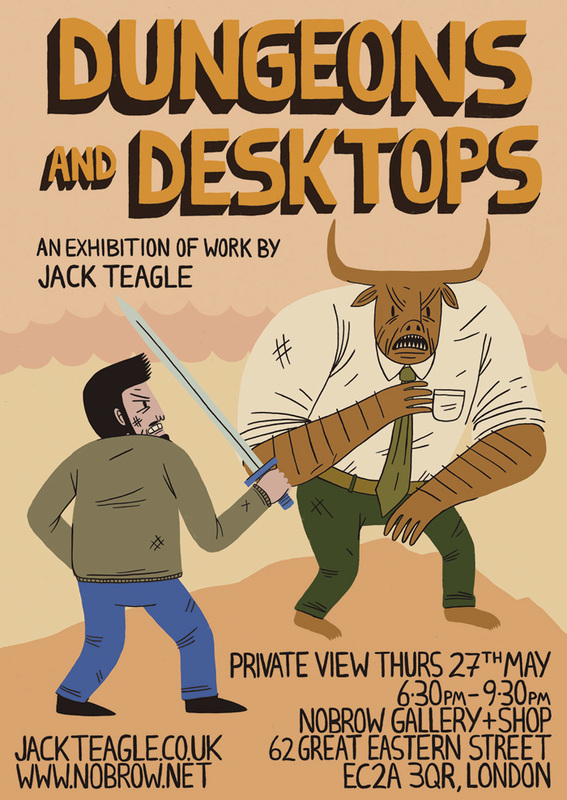 Dungeons and Desktops is an exhibition that seamlessly melds the worlds of the fantastic and mundane, a cornucopia of staplers and swords, benefits and beasts, hair monsters and HR managers. So make sure you make your way over, we will be selling prints, sculptures, original works and of course the entire Nobrow catalogue of products at the event as well as signed copies of Mr. Teagle’s very own 17×23 comic ‘Jeff: Job Hunter’. The show was a great success, thanks so much to everyone who came and made it a very enjoyable and productive night. Dungeons and Desktops runs until July 22nd. Thank you Andy Hague for the amazing pics!